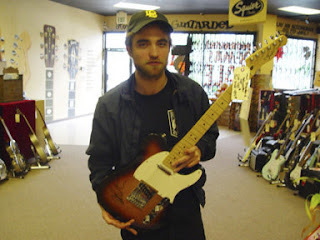 Robert Pattinson, taking a break from his role as vegan-vampire Edward Cullen from the Twilight series, recently stopped by Norman's Rare Guitars in Tarzana, CA to pick up a guitar for himself and also signed a Telecaster to help raise funds for Midnight Mission. Midnight Mission provides education, job training and transitional housing for the homeless. Looking rather dishevelled himself in this pic, Pattinson is one of several celebrities who play the guitar some and invest in vintage instruments for their personal collections -- old guitars are gold, baby! Why else would he be hanging at Norm's right?